Discussion in 'Fan Art' started by Rekkert, Apr 21, 2017. Any chance you could post a closer view of the MSD? I'm having trouble making out what's different about the Astraeus' nacelles from a standard Galaxy. @Donny: Thanks! Indeed, I definitely want to keep the moodiness of it, it's just finding the right balance. @cardinal biggles: Sure thing. Also, here's a gallery with several images of the ship's exterior, they do a better job at showcasing the changes. Michael, TOMFAN, scifieric and 2 others like this. Good stuff, thanks for the bonus. Remember how I said some inspiration would come from a certain alternate timeline? 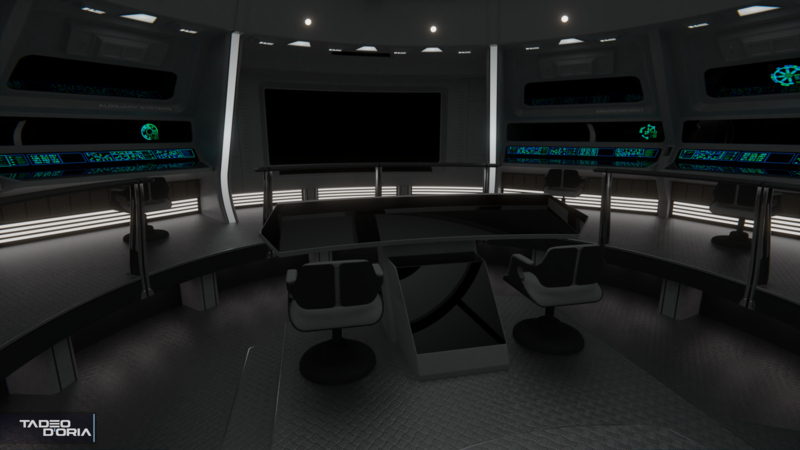 Well, here it is, the chairs for the stations are a modified version of the Kelvin bridge chairs, which are one of my favorites to ever appear on a starship bridge. The color pallet, and the base of the chairs, are lifted from the TUC Enterprise-A. As you can see, I've also added labels on the four central consoles, similarly to how the Stargazer had them. 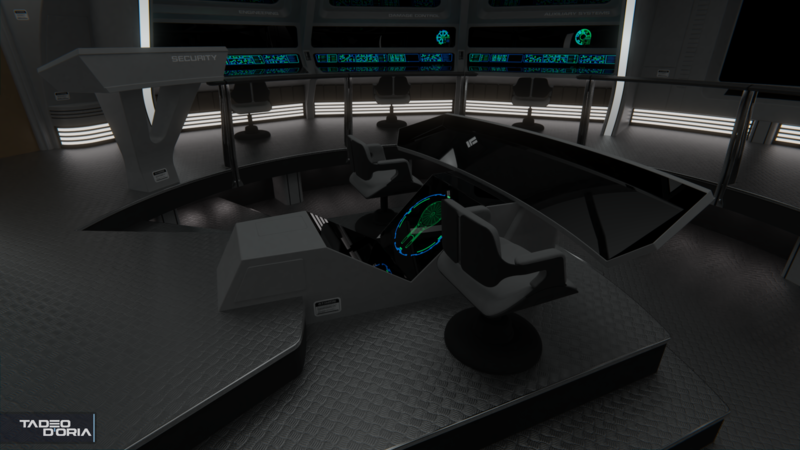 I will have to modify the helm station slightly though, currently it's based in its appearance in TFF, so it sits higher than it did on TUC (plus, I have to add the little table add-on at the back). Jesse1066, CaptainSerek, TOMFAN and 5 others like this. Jesse1066, Scribble, Blip and 2 others like this. 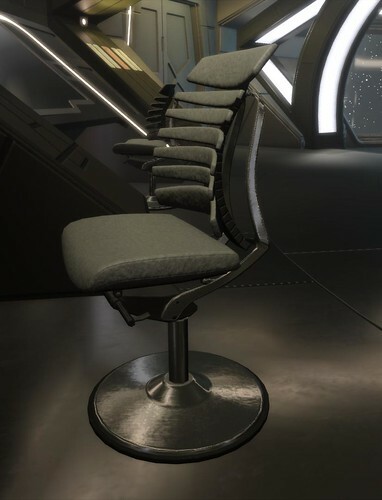 You know, I had to model the chairs for the Discovery bridge for Star Trek: Online's latest Discovery-era release, and I got lucky because I found a brochure of the actual purchasable chair, complete with orthographic views. Can you share the info on this? Cool that you could find the references for that one! It really is a lucky break when good references are around. Your reproduction is incredible; even if I'm not exactly a fan of the actual chair design. Matthew Raymond, CaptainSerek, Scribble and 2 others like this. Lt. Washburn, Scribble and Rekkert like this. Thanks for sharing! Pretty funny how that first link tries to sell you the chair by showing someone not using it. 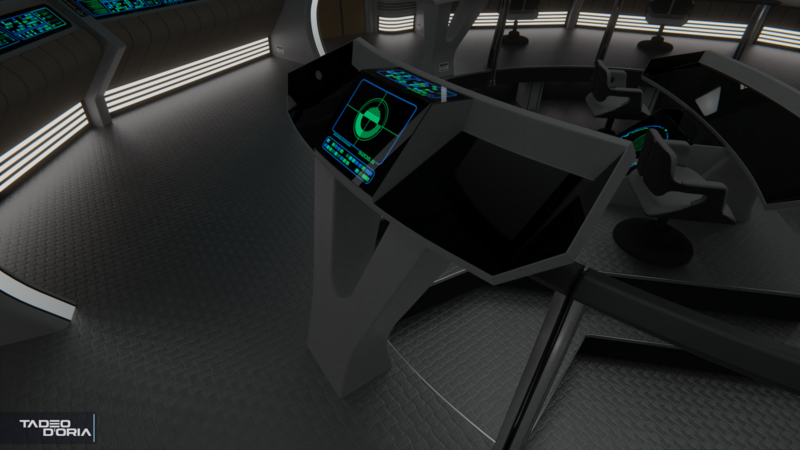 More work on the helm console, modifying it sit lower as the TUC version, and with the back 'table' bit added. It's not intended to be a 1:1 reproduction of the TUC helm however, several details are purposely different, like the lack of the lights at the sides and the (still not done) TWoK inspired controls. Donny, CaptainSerek, TOMFAN and 2 others like this. Poor security and Tactical officers.. Always have to stand up all day..
Now on chairs!.. where's the adjustment devices? like a knob? 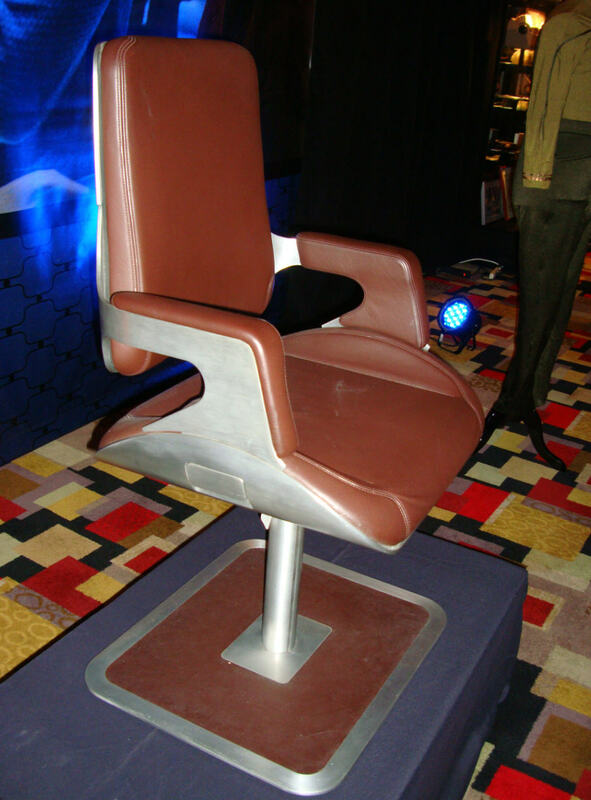 Star trek needs more comfortable chairs! Your seating down for 8 hours.. atleast a nice computer chair! he he..
On tactical/security.. 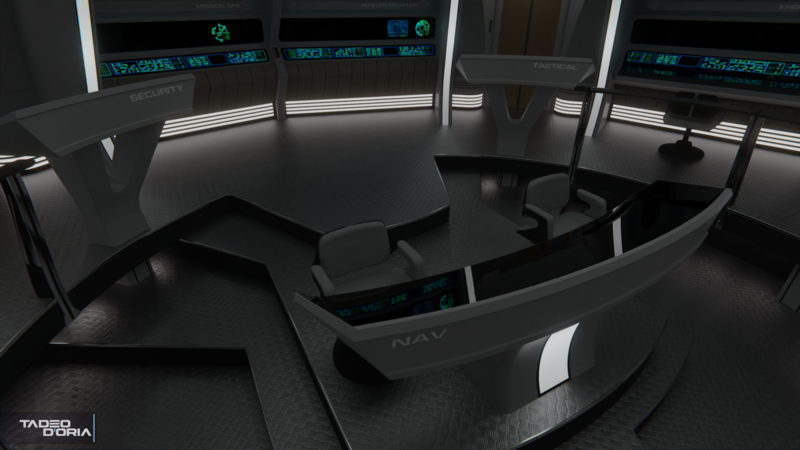 I liked the TMP refit bridge concept of that, in a corner facing forward in its own nook... has a chair.. There is an adjustment lever on the side, but it's not that easy to see on the black chairs. 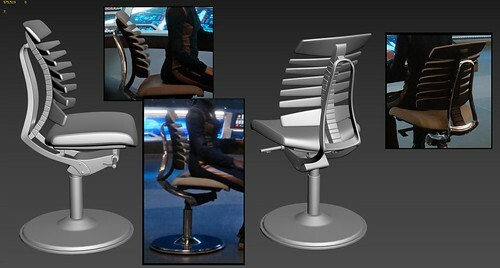 These are some of the more comfortable looking chairs in Trek bridges, which is why I like them so much! A lot better than what the Ent-A and Excelsior had! 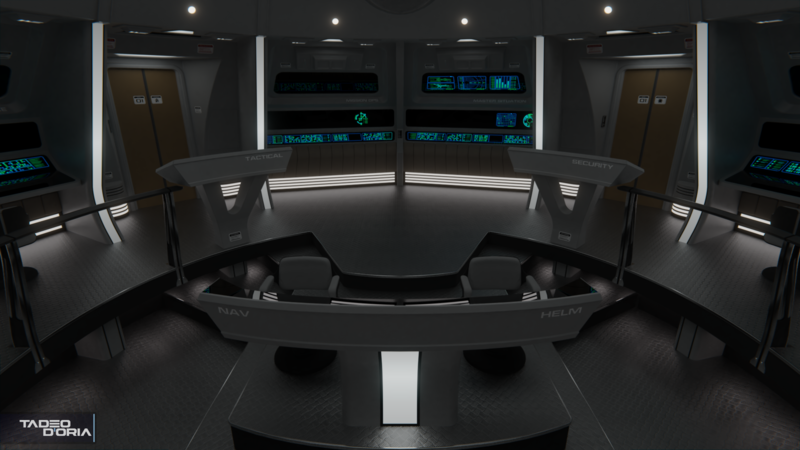 I usually like everyone to have a chair on bridges, but I must admit I like the standing consoles here, it's a natural fit on the more utilitarian TMP aesthetic, rather than on the 'luxury hotel' aesthetic of TNG. I've worked on the keyboards for the wall facing consoles. 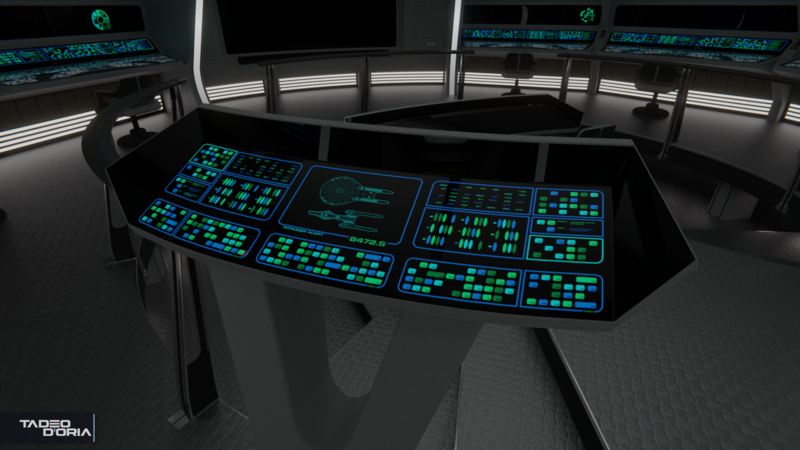 These take a lot of inspiration from the Enterprise-C consoles, using the same muted colors and numbers at the top. 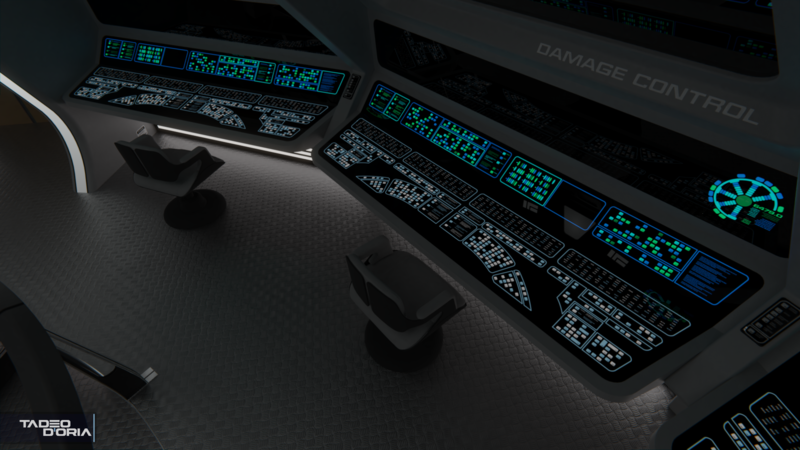 However this is mixed with the traditional Ent-A keyboard layout, and they're only lit half as much as the other consoles, similarly to the unlit segments of white and light blue controls on the Ent-A science and comms stations (see the lower right corner here). Matthew Raymond, Donny, TOMFAN and 5 others like this. Wow! I love how this is coming along and the colors go great with the era LCARS. 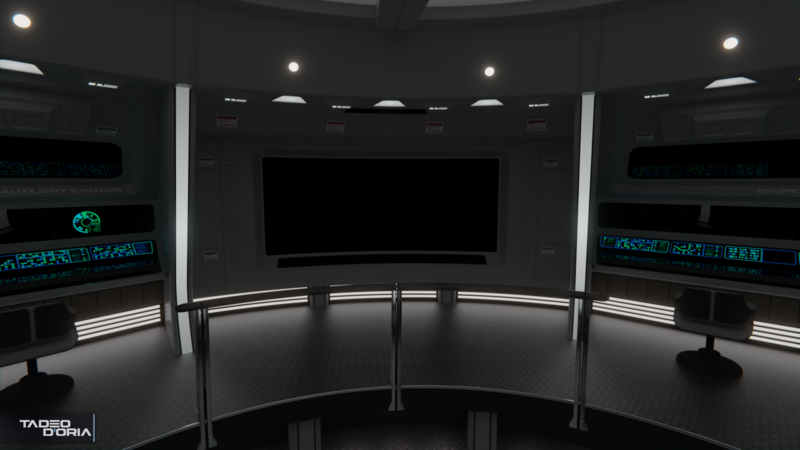 I've created the central monitor area for the tactical station, which is heavily based on the transporter/torpedo room console from TUC, including its awkward looking top keypad panel. valkyrie013, Lt. Washburn, Michael and 6 others like this. I like that you’ve given those side consoles a curve to conform to the curve of the bridge pit. Good work! @Donny: Thanks, though that was actually my client's idea. Looks a lot better than it did before. 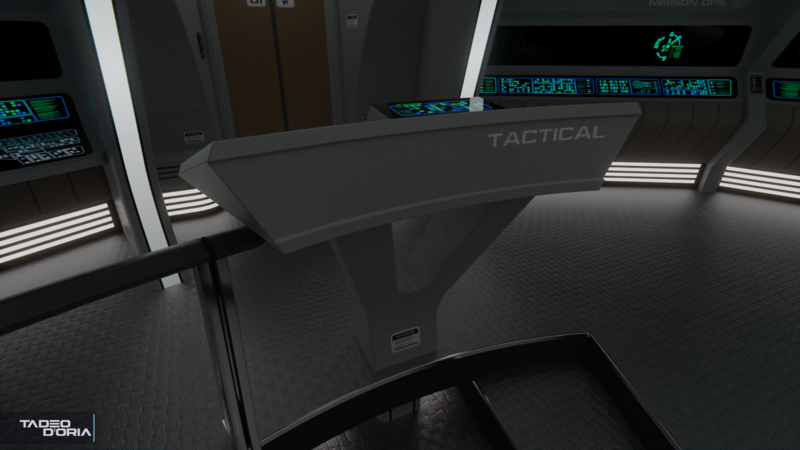 I've finished the layout of the tactical console. The central monitor has some raised TWoK style controls at each side. 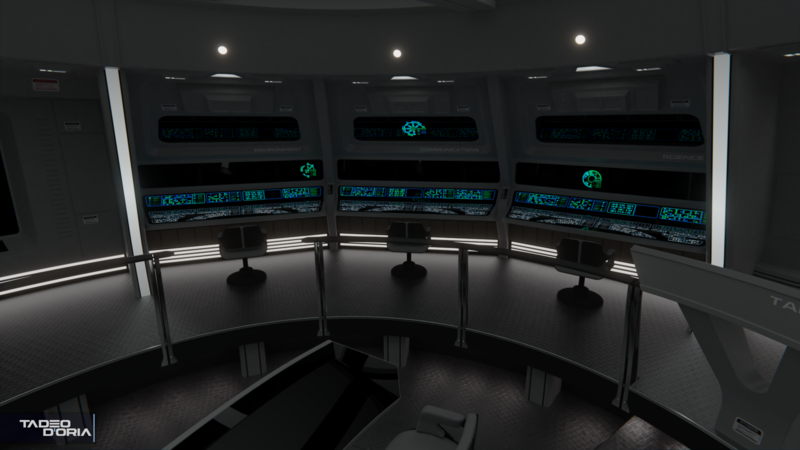 A small bit of this style will also be added to all the wall facing consoles, and will be prevalent in the helm/nav console. In tangentially related news, I'm starting to work using Blender 2.8. It's still in alpha state but it has so many changes and improvements already that I've better get started now. The ability to render with the GPU and CPU at the same time is certainly gonna be very useful once I'm able to finish my new PC build. Matthew Raymond, TOMFAN, CaptainSerek and 4 others like this. That awkward top panel is probably for running diagnostics or something to that effect. Maybe a simulation generator. Eevee has been pretty cool. I'm definitely loving it more and more. I'll be honest I never learned much about cycles, and now that eevee is realtime, I am starting to pick up some things for cycles by learning how to use eevee. 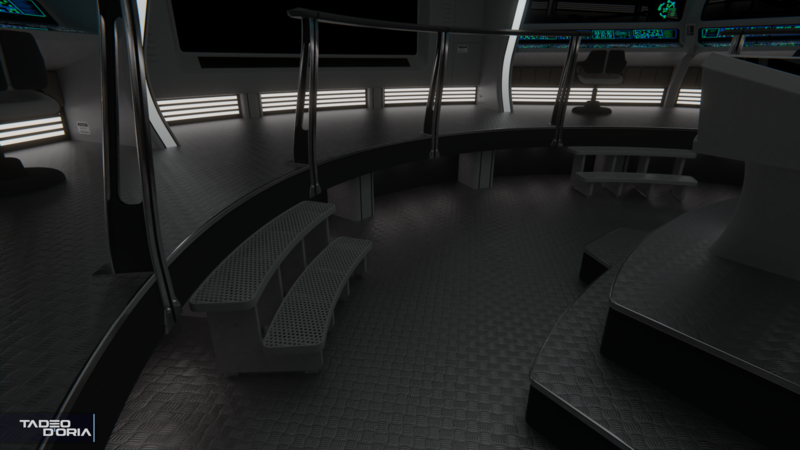 A cool trick is using Cycles to create an Environment map of your scene, and then put it into Eevee, setup the Environment map, setup the lamps. @batboy853: I haven't played much with Eevee yet to be honest. 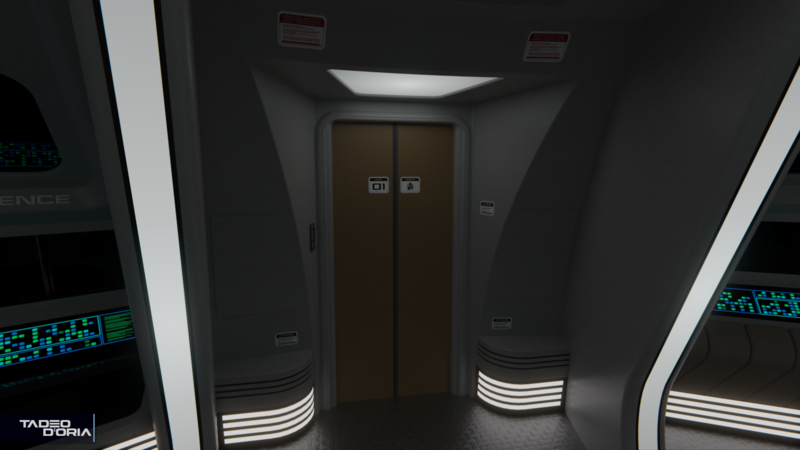 I'm so used to a true PBR workflow without the artificial lighting solutions that are so common in real-time rendering (like point lights and the such), that I feel it's kinda moving backwards to go back to it, not to mention that quality does decrease a bit in the particular use case I have (closed rooms). 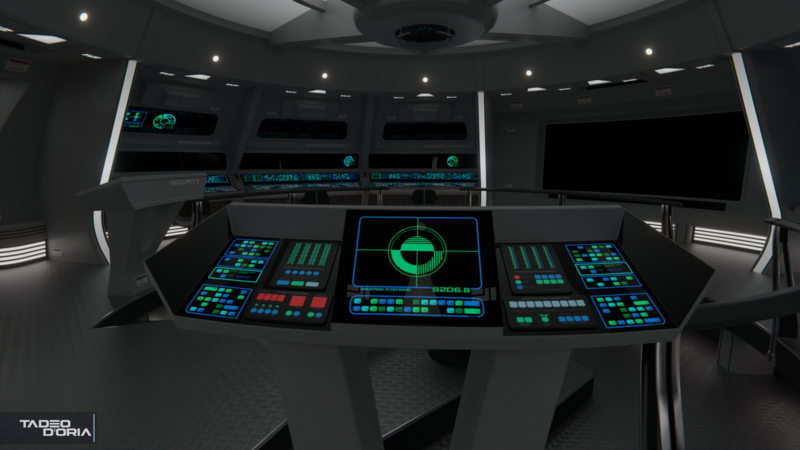 I've worked on the security console, which in contrast to tactical doesn't have a central monitor and is entirely comprised of TUC style Okudagrams (though the central screen area has a graphic inspired by the TWoK bridge). I've also added in the little steps on the front of the main pit. I had fun creating the procedural texture with holes, I usually don't like using actual textures (because they're an asset I didn't create) so I try and do these procedurally within Blender whenever I can. Matthew Raymond, Blip, TOMFAN and 2 others like this. This bridge is coming out great! Nice work!